With her tasteful interior styling and modern entertainment equipment, Milk Money is the ideal yacht for entertaining and relaxing. 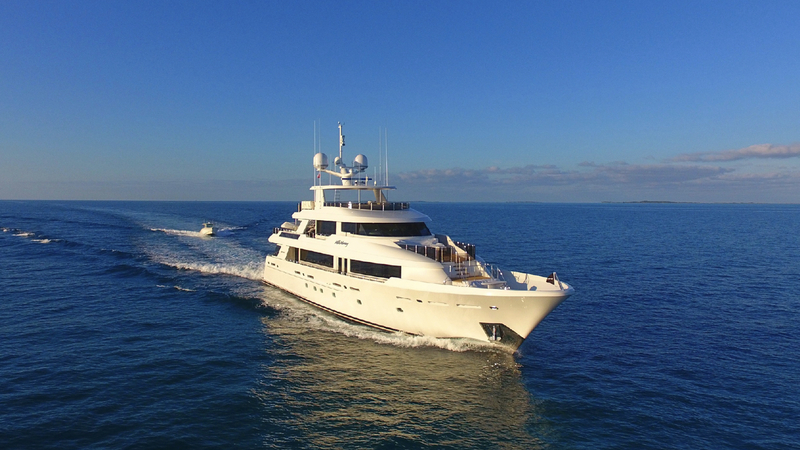 She comfortably sleeps up to 11 guests in five luxurious en suite staterooms. The spacious master stateroom with king bed is located on the main deck forward. Below are two VIP king staterooms, and two twin staterooms one of them equipped with a twin bunk bed. Guests will enjoy spending time on her large sundeck, ideal for alfresco dining as well lounging in the inviting Jacuzzi. For guests looking to work out, exercise equipment is set up on the bridge deck. Milk MOney stands out for her impressive water toy collection, including a waterslide, two Sea-Doo waverunners and a 37′ Boston Whaler tender rigged for deep sea fishing fun! She is the perfect yacht to create a memorable experience for guests of any age. Find All Luxury Yachts Rentals here.